Thanks, Mom! – Peachtree Publishing Company Inc. Enjoy memories of mothers’ abiding love and benefit Habitat for Humanity. Memories of a mother’s abiding love can do more than shelter the heart. In the case of this new inspirational gift book, it can build houses for low-income families. Sixty of America’s most celebrated personalities—actors, writers, artists, musicians, politicians, religious and business leaders, and sports figures—share their personal stories and offer tributes to their own mothers in a charmingly illustrated gift book which benefits Habitat for Humanity International. Stories and brief quotations are organized by category, reflecting the values and lessons each mother taught her child. 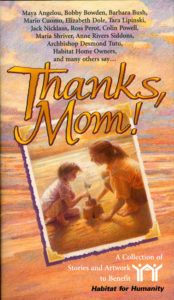 Decorative pages provide the opportunity to write your own unique tribute to your mother. A lovely present and a reminder of the many gifts given to us by our mothers, Thanks, Mom! offers powerful inspiration from the women who raised us. Your purchase of this book will help Habitat for Humanity build low-cost housing with families in need. Contributors include: Maya Angelou, Bonnie Blair, Erma Bombeck, Leo Buscaglia, Barbara Bush, Ken Caminiti, Mario Cuomo, Elizabeth Dole, John Grisham, Merle Haggard, Tara Lipinski, Ed McMahon, Jack Nicklaus, Joe Paterno, Pope John Paul II, Colin Powell, Chi Chi Rodriguez, Maria Shriver, Anne Rivers Siddons, Lee Smith, Marty Stuart, Reverend Desmond Tutu, Heather Whitestone, Judy Woodruff Andrew Young, and many, many more. Gene Stelten has been involved with Habitat for Humanity for more than twenty-five years, volunteering his time both in the boardroom and on construction sites. An electrical engineering graduate of the University of Cincinnati, he worked in sales and marketing management for Motorola, Inc. for thirty-two years. He has edited three books benefiting Habitat for Humanity. Stelten lives in Georgia.